Resetting a web browser to its factory default settings is sometimes a last resort when it comes to troubleshooting issues, especially if all other repair options have failed. The consequences are manifold. All custom settings and preferences will be reset to their default parameters, which means that the browser has to be customized after the resetting again. Some browsers copy select data over to the new profile after the reset. Firefox for instance copies bookmarks and other static data over so that it remains available. 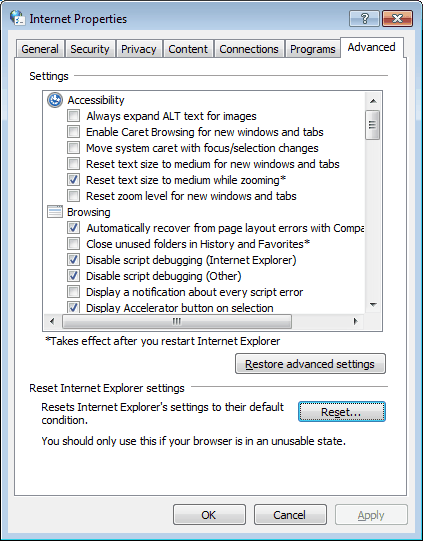 All popular Internet browsers offer an option to reset the settings. This article describes how to reset the settings of Internet Explorer, Mozilla Firefox, Opera and Google Chrome. Update: Resetting has become a tad easier. You can now load about:support in the address bar to reset the browser from there right away. You can read more about the new Firefox reset feature here. Firefox users need to start the web browser in Safe Mode. A Safe Mode option is usually available in the start menu listing, at least if the operating system is Windows. It is also possible to add the safe mode parameter to the launch of the browser. This is done by adding -safe-mode as a parameter. 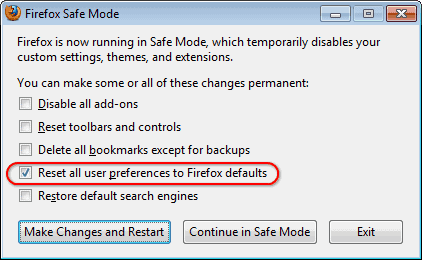 Windows users can enter firefox -safe-mode in the run box to start the browser in Safe Mode. Last but not least, you can also hold down Shift before you start Firefox to launch it in Safe Mode. Firefox needs to be completely closed before it can be started in Safe Mode. A startup window is displayed if Firefox is started in Safe Mode. One of the available options is to "Reset all user preferences to Firefox defaults". Selecting that option, and then the button Make Changes and Restart, will reset all Firefox settings to their default values. All available versions of Internet Explorer support a browser reset. 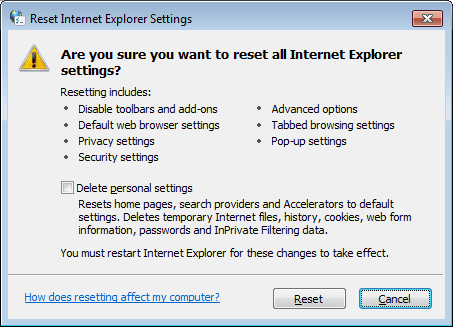 Resetting IE will delete all add-ons and customizations, so that all settings are reset to their default values. Microsoft has created a Fix-It solution to reset Internet Explorer on all supported operating systems but Windows 7. Update: The guide below describes how to reset the old version of Opera. It does not seem possible right now to reset the new version of Opera. A reset of Opera is described in detail here . Both however deal with previous versions of Opera, not the latest versions. Resetting Opera centers around deleting the opera6.ini or, in newer versions of Opera, the operaprefs.ini file which contains the preferences. Those files are found in the user directory of the operating system. The easiest way to locate them is to enter about:opera in the address bar, and locate the Preferences path in the display. Opera needs to be closed before the file is deleted. We suggest to create a backup of the file before deleting it. Home page: The New Tab page is set as the home page and displays whenever you start up Google Chrome. The Home button is turned off on the toolbar. Passwords: Google Chrome offers to save your passwords. Security and privacy: All cookies are allowed, Phishing and malware protection is enabled, Smart navigation error suggestions are enabled, DNS pre-fetching is enabled, Address bar suggestions are enabled. Update: Google has implemented reset functionality in Google Chrome 29. Load in the browser's address bar, click on show advanced settings, and scroll down until you find the reset button in the interface. A few additional options are available, if reseting the browser does not yield the desired results. One option is to create a new user profile, which always comes with default settings and no initial modifications. Please take a look at How To Create New Web Browser User Profiles for this. Do you have additional tips on how to reset web browsers? Let us know in the comments. Find out how to reset Mozilla Firefox, Google Chrome, Microsoft Internet Explorer and the Opera Browser to factory settings. This tutorial is for old vision.